194 miles separate Guiseley A.F.C.’s scenic Nethermoor Park ground from Boreham Wood’s modernised Meadow Park, but the two sides battling for points on this bright autumnal weekend have much in common. Both clubs have belied their small stature to reach the pinnacle of the English Non-League. Both are part-time clubs with modest attendances, and each triumphed via last year’s playoffs, vanquishing more fancied opposition – including Chorley and Havant & Waterlooville respectively – along the way. It’s also the first year at this level for both The Lions and The Wood. So, with just 4 points dividing them before kick-off, could either team come away with a priceless victory? I arrive in Guiseley just after midday, and am instantly enamoured with this attractive corner of West Yorkshire. 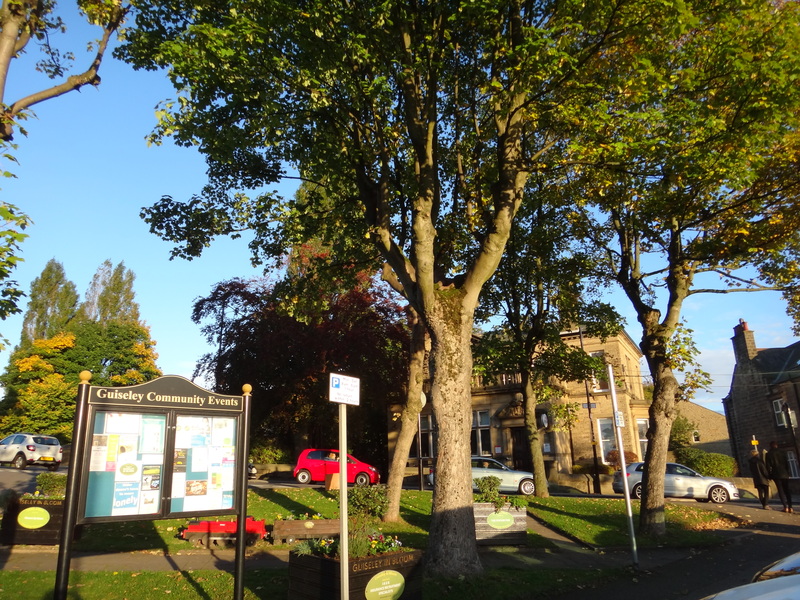 Resplendent with handsome brick and stone buildings, dotted with tranquil green spaces and imbued with a resolutely laid-back feel, Guiseley may be just 10 minutes from the bustling heart of Leeds, but its peaceful, traditional vibe feels a world away. The scenic heart of leafy Guiseley. My first stop is the Station, a lovely pub and pizza bar, with strong ties to the football club and located a stone’s throw from the ground, on Otley Road. The food is – with no exaggeration – fantastic. 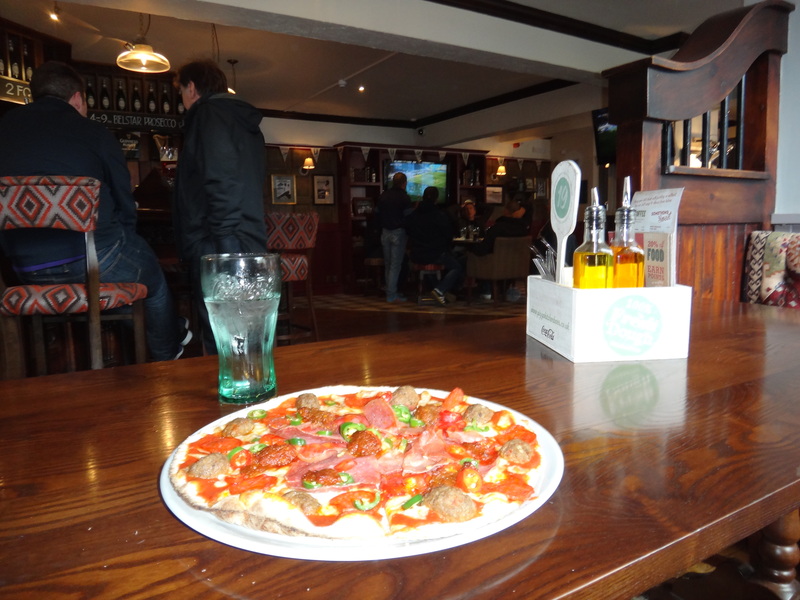 I enjoy a sumptuous pizza, as fans of both teams congregate in number around the pub, preparing for the crucial clash. Involved with sponsoring their local team, the Station’s doors and walls host posters beseeching fans to go and support the Lions. I hardly need the encouragement. The Station pub is rightly famed for its superb (and spicy) pizzas. Nethermoor Park – shared with the town’s cricket club and, erm, a childrens playground – is less than half a mile’s walk from Guiseley railway station and the appropriately named pub across the road. It’s a quick and straightforward stroll through the pleasant surrounds of this picturesque Leeds suburb. I head in through the turnstiles to the sight of Guiseley’s players milling around, chatting to early arrivals on the terraces and beginning their warm-up. The Boreham Wood squad wander into the club bar, a few of them stopping to chat with the hardy Hertfordshire fans who’ve made the long trip and are enjoying the gravy-heavy cuisine on offer here. Keen to get an insider’s perspective on Guiseley’s first season at the National League’s top table, I speak to Brian, a veteran Lions fan ahead of the game. “Reasonable” is his one-word summary of the year so far. He credits the team having “not lost too many”. “Too many draws” is his main issue thus far, but he’s “confident we’ll stay up”, predicting his side to finish in mid-table. As a neutral, it seems optimistic, but this is a club which has repeatedly upset the odds to achieve success, having been Northern Premier League stalwarts until as recently as 2010. 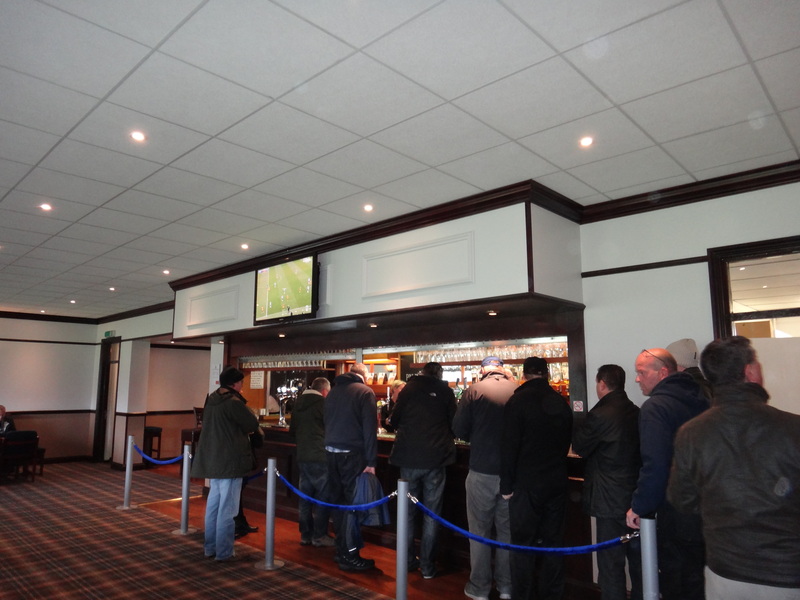 Due to being slightly under-the-weather, I stick to the soft stuff, but there’s a good range of drinks on offer in the ground’s Clubhouse – all at a reasonable price. The place is roomy, full of snug sofas and there’s lunchtime football on TV screens. All in all, a pleasant spot to pass the time before the serious business on the pitch begins. I flick through the match day magazine, where Lions boss Mark Bower candidly seethes about last weekend’s penalty decision at The New Lawn. Overall it’s a good read, though at £3 perhaps a touch steep. The guys of Guiseley and the Wood Army congregate for a drink in the comfy Clubhouse. I take a pew in the Main Stand, one of only two seated area within the ground – both running along one side of the pitch, with a combined capacity of 500. Across the other side, the unusual, covered terraces of the JCT600 Stand are also split, with two cameramen located perilously between on a makeshift gantry, presumably hoping that the wind doesn’t pick up. There’s no formal setup behind either goal, but a handful of supporters of both sides are crowded by the fence at each end. Ground ‘improvements’ are set to take place in the coming months at Nethermoor, and whilst some roofing at either end wouldn’t go amiss, one hopes that any changes don’t spoil the likeable, low-key feel of this picturesque venue. As the game begins, the home side look much the brighter. Within the opening few minutes, a good passing move gives Guiseley captain Adam Lockwood the first chance of the match, but the experienced defender fires his effort well over the bar. Buoyed on by their early dominance, the home side look to have taken the lead after a goalmouth scramble, but the Boreham Wood defence somehow clear the ball to avoid an opening goal – and it’s as close as either side come for the majority of a quiet first half. The West Yorkshire side’s dominance of possession continues throughout the first period, but to no avail. The inconsistent Tom Craddock – in a particularly poor display – wastes a golden chance after Liam Boyes’ fantastic build-up play, just beyond the 15 minute mark. George Maris produces a scintillating run a little while later, but he too fails to trouble Wood stalwart James Russell, between the sticks. Amidst an overly whistle-happy refereeing performance and a defensive Wood side seemingly happy with a point, the first half seems set to be petering out. Then, in first-half injury time, talented teenager George Maris receives the ball on the wing. A blur of movement, against the rich autumnal hues of Nethermoor’s grand trees, and the Guiseley A.F.C. flag flapping grandly in the wing, he skins the Wood defence, cutting inside with a dexterous flair. He locks his eyes upon Russell and curls a shot past the helpless Russell. It rolls inches wide, and a collective sigh rings out as the patrons of the Main Stand (myself included) head down the steps to seek some comfort in a cup of tea. So close to delight, we stand unified, resigned to the reality that Boreham Wood may not be so wasteful – if they ever create a chance, that is. And they do. Boreham Wood begin the second half with a newfound tempo and slickness. They have a goal ruled out for a narrow offside, before Conor Clifford fires wide after some sumptuous footwork. Then, the visitors get the breakthrough. In the 59th minute, a soft free-kick is awarded on the right wing, and the imposing Clovis Kamdjo heads home smartly. His distinctive dreadlocks breeze through the air as he races away in triumphant celebration. After back-to-back home defeats against Lincoln and Macclesfield, the Lions have to pick themselves off the mat against a Wood side growing in confidence. ‘Give him a BAFTA!’. The Guiseley support are annoyed by a piece of perceived play-acting. It’s an oddly moderate shout, as if this isn’t Oscar-worthy fakery, but still deserves a less prestigious award. But to brand the Wood as time-wasting would be unfair. For the most part, they continue to push forward, looking to extent their lead. Steve Drench – superb in the Guiseley goal today – produces two excellent saves in quick succession to deny the tireless Jamie Lucas. At 1-0 down, Guiseley attempt to build a late attack. Then, against the run of play, Guiseley strike a leveler in the 90th minute. But referee John Brooks has already blown for a Lions penalty, chalking out an equaliser, at least for the moment. Joy turns to fury. Fury turns to anxiety, as Nicky Boshell places the ball on the spot. Then joy reigns again, as Boshell slots home with perfect placement, to bring Guiseley level. As injury-time begins, the Wood push forward frantically. They miss a couple of good chances, and as with Guiseley in the first period, the Herts. Side are left to rue their profligacy. The whistle rings out. The points are – fairly – shared. Overall, Guiseley has offered one of, if not the best matchday experience I’ve had in the National League. It’s a lovely place not only to watch football, but to enjoy a warm autumn afternoon. Just before reaching Nethermoor Park, I passed a chap walking in the opposite direction, clad in a Leeds United tracksuit. Some people, man. They don’t know what they’re missing. 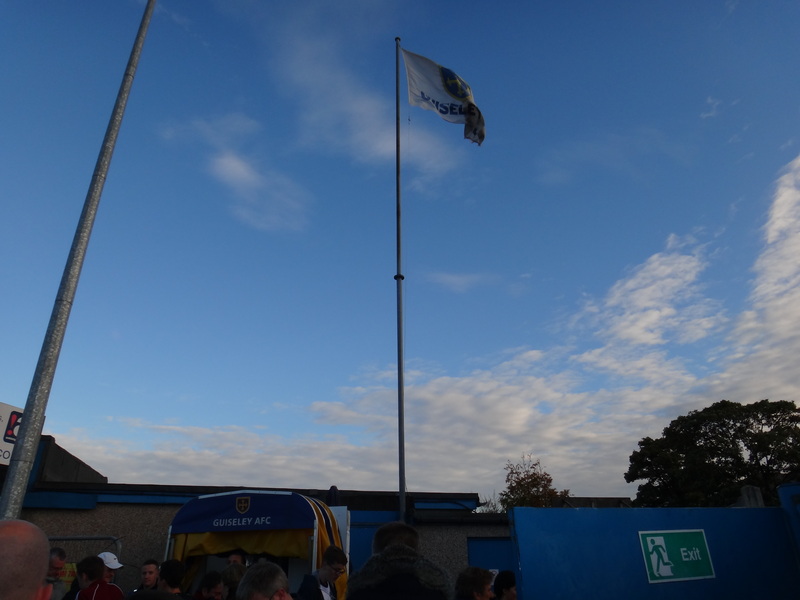 The flag flaps proudly as fans exit Nethermoor. Ticket Prices: Adults (£15), Concessions (£10), 12-18 year olds (£5), Accompanied u-12s (Free) – prices the same for seated and standing areas. Travel: Guiseley is well served by rail, with regular services between Leeds and Ilkley, as well as services from Bradford Forster Square (also terminating at Ilkley). Buses also run to Guiseley from Leeds, Bradford and Harrogate. The station is 0.4 miles from Nethermoor Park. By car, the football ground is along Otley Road/A65 and very close to Bradford Road/A6038. The main car park is on Netherfield Road. There is limited parking at the Otley Road End of the ground, but much of this is reserved for players, club staff and officials. 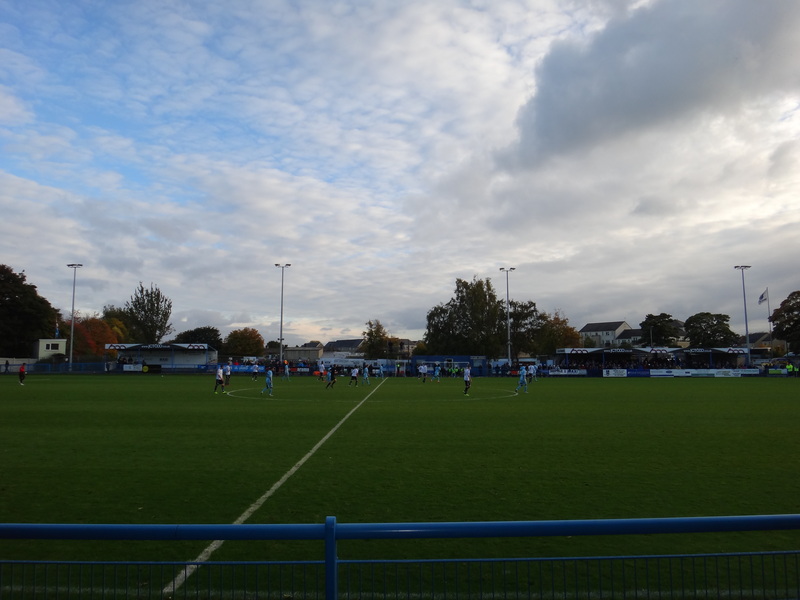 Posted on October 18, 2015, in Dave's Matchday Adventures, Vanarama National League and tagged Boreham Wood, Featured, Groundhopping, Guiseley, Matchday, National League, Nethermoor Park. Bookmark the permalink. Leave a comment.